At First Sight: At La Maison des Sorcieres, Magalie Chaudron and her two aunts work magic into chocolate. There, in their contained little world, the three women create beautiful-chocolate based confections, they weave spells into their chocolate and tea so the drinker might get their heart's desire (or whatever they happen to be needing the most at that time). Magalie's world was perfect - she loved working at the shop, and living above it - until the day that Philippe Lyonnais walked in, rattling things. Philippe is a world class chef, and came to Magalie's street to open one of her famous pastry stores, which worries Magalie, thinking he'll steal way all her costumers and force her out of business. And, even though that's not Philippe's intention at all, a war begins between the two of them. 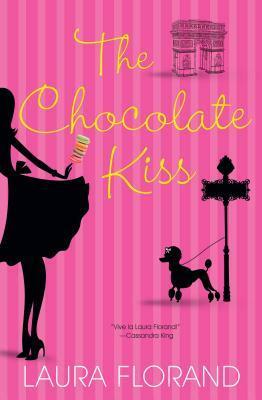 Second Glance: Oh God, I so wanted to like The Chocolate Kiss because, hello! Chocolate and Paris!! What more can a girl ask for?! Also, I had heard some really awesome things about Laura Florand so I was, like, super pumped for this book. Let me start by saying that there is a lot of good in it! The descriptions of chocolate and food alone were worth the read. I liked Philippe and the contentious relationship between him and Magalie that later blossoms into so much more. There were parts that were really romantic. The story was cute and quirky and whimsical, and that was my main problem with the it: the writing was too whimsical at times, and this affected my reading experience in two ways: first, sometimes it was just hard to read, I got tired following the prose because it was just so quirky and whimsical (both the situations described and the way they were described). Second: this style kept me from fully connecting with Magalie. I was reading her story, but I didn't care very much for her as a person, if that makes sense. I get where she's coming from and why she loves the shop and wants to drive Philippe away (it's her home and she feels it's in danger), but I always felt a distance from her (and from the other characters as well). Bottom Line: The Chocolate Kiss is a sweet story, there is no mistake about it, and it's quite worth the read but I feel like, personally, the writing style is not my favorite. I can see why a lot of people like it though, so if you're in the mood for something quirky and sweet and whimsical, then this is for you.